What do you think of when we say the word Australia? Is it a kangaroo, a koala, Ayers Rock or perhaps even the actors Nicole Kidman and Russell Crowe? There is one image that springs directly to your mind, namely one of the most recognisable and most photographed buildings in the world : the Sydney Opera House. The Opera House is situated on Bennelong Point in Sydney Harbour and is the result of an international competition won in 1957 by the Danish architect Jorn Utzon. It all started in the 1950's when the director of the New South Wales Conservatorium of Music and the conductor of the Sydney Symphony Orchestra, Eugene Goossens, began to press the State Government to buil a performing a rts centre in Sydney. The premier of the day, the late Mr Cahill, was enthusiastic about the idea and it was he who set up the committees which got the project under way. The construction of the building, which started in 1956, proceeded in three stages; The first stage consisted in building the foundations; the second one was the construction of the shell roofs and the last stage was the interior design. Although the construction had been estimated to take about five years, Utzon wanted more time in order to tackle the various technical challenges of his design. But the government refused his request and financial problems soon arose. Due to the pressure, Jorn Utzon resigned from the project in 1966, when the exterior was almost complete, and was succeeded by four Australian architects. The building took about 19 years and $102 million in all to plan, build, equip and furnish. Because of its name, many people think the Sydney Opera House has just one theatre. It has in fact, four main performing halls and over 900 other areas. The largest is the Concert Hall, which can seat 2,679 people and which is used by the Sydney Symphony. It also contains the Sydney Opera House Grand Organ, one of the largest organs in the world, with over 10,000 pipes. The other three main halls are the Opera Theatre, which is the home of the Australian Ballet, the Drama Theatre and a cinema. The House also has a recording hall, an exhibition hall, two restaurants, six theatre bars, a library and so on. Performances presented in the House include orchestral and chamber music concerts, opera, ballet, drama, choral works, jazz, pop and folk concerts, films and variety shows. Many areas are also available for private functions. The first performance in the Opera House, presented in the Opera Theatre in 1978 was The Australian Opera’s production of Prokofiev’s War and Peace. The complex was officially opened by Queen Elizabeth II in 1973. 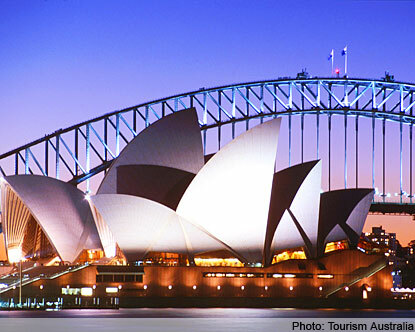 The Opera House, which became a UNESCO World Heritage Site in 2007, put Sydney on the world map, both architecturally and culturally. Its events attract some two million visitors each year, making it one of the world's most popular cultural institutions.